Mini blogs and information about our Fabric UK range. If you were lucky enough to be handed one of these handmade Mystery Cards cards by Myself at the Visual Merchandising and Display Show then you would have had chance to have a feel of the fabrics and ponder over their origins. Well, wonder no more. All the information you need to match up the fabric on the Mystery card is right here to scroll through. Each fabric has a little write up and if you want to buy, get samples or look at the colour choices, just click on the picture and it will magically take you to the website. The Fabric UK Mystery Card! These 12 fabric samples are just the tip of the iceberg, a taster of what we have in store for you ( pun intended). Our Birmingham store is piled to the rafters with fabric, as well as our huge warehouse directly next door. We deal with a lot of bulk orders, so we think it’s better to have the rolls on hand and ready to go. The 12 fabric samples I chose represent the diversity of fabric we have here. The Mystery Card is aimed at visual merchandising teams who work with varied fabrics. Each new job brings new ideas and new fabric to work with. So, on with the introductions, get your cards out and match up the fabrics! All the look and feel of the smiley seawater creatures, without any harm coming to the stingrays (or humans) in the process. 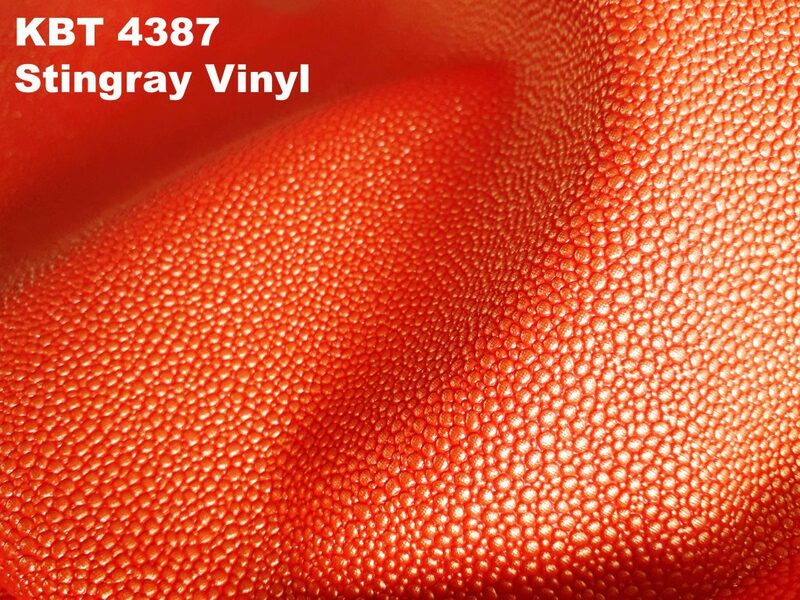 Our Stingray Textured Leatherette Vinyl is created to replicate the bobbled texture of it’s underbelly. The vinyl is available in 11 shades, 9 of which are printed to give a two tone effect. The vinyl is produced with a base colour and embossed to give a realistic look and feel of a stingray. A separate metallic shade is then layered over the top of the vinyl so it just catches on the top of the raised texture. This clever trich really brings out the 3D embossing and makes it stand out even more. You can see here in the image it has a deep orange/gold look. The base colour is in fact red and the top part is printed with gold so the shade is simply called Red. Click the pic to take you to the Stingray page…. Yes, this is the same stuff used for classic Fuzzy Felt fun, just on a much larger scale! 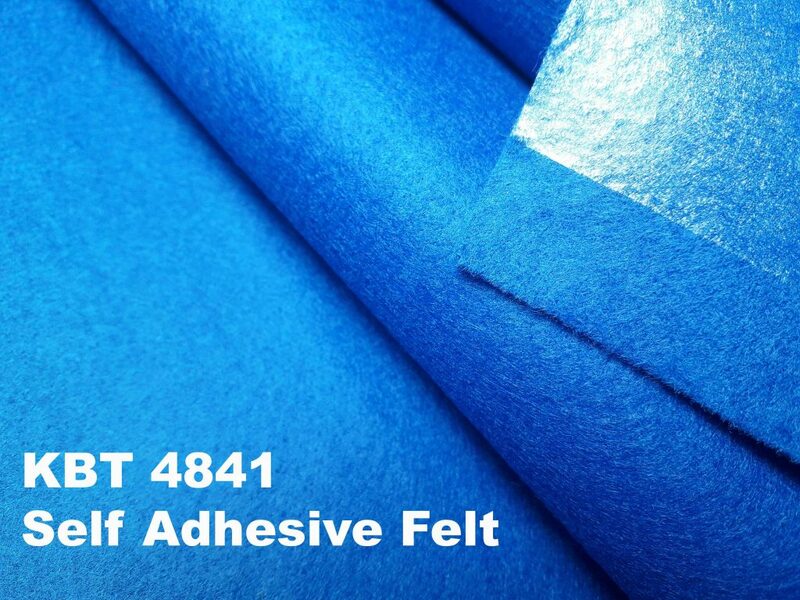 We stock two types of felt, one classic non sticky variety and one with a very sticky backing. The backing itself is protected with thick waxed paper which you peel away when you are absolutely ready to stick it, and not before. I stress this point because the fabric really does its job well. It’s extremely sticky, so make sure you have everything decided and prepared before you go for the stick! There are 21 colours to choose from in the range, including some terrific brights like this Royal Blue. 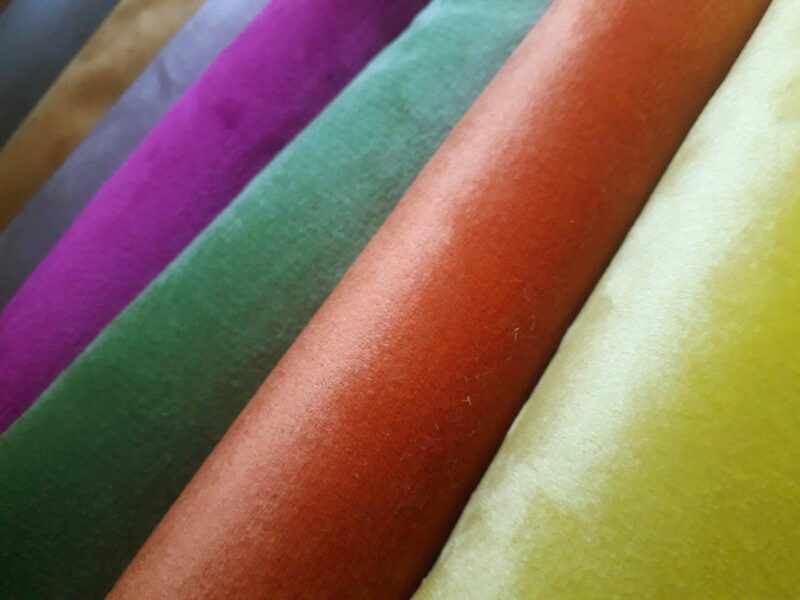 Prices start at £7.99 a metre and the felt is 145 cm in width. Click the pic to see more…. Neoprene is the sort of fabric that is so popular, it goes under the radar. There are so many uses for Neoprene its hard to keep count. 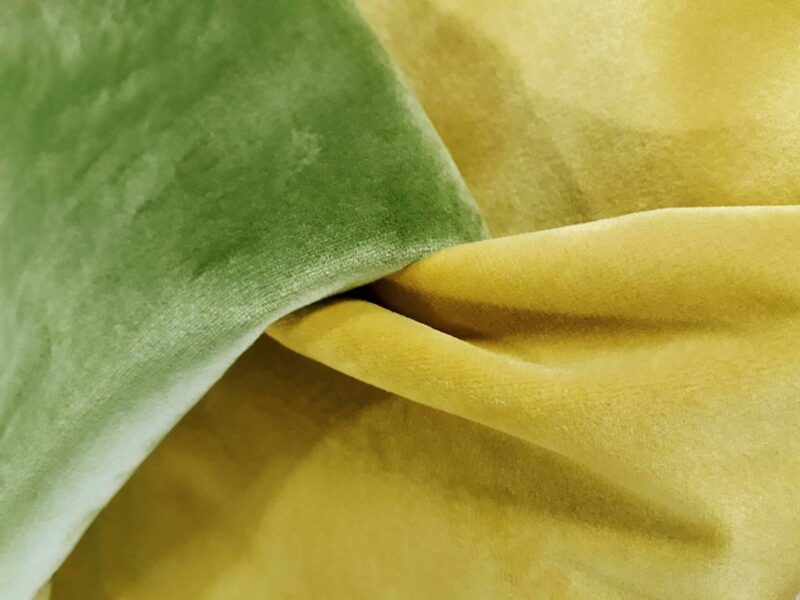 This relatively modern fabric is mostly known for its use in outdoor water activities but there is more to this spongy fabric. There is probably Neoprene somewhere near you now in some form or another, to name a few uses, car seats, hospital braces, gym belts, mobile phone holders, baby bibs, changing mats, booties, toys, laptop bags, bags, shoes, fashionwear, and of course sportswear. The middle section of Neoprene boasts a thick foam created by jet infusing minute air bubbles into polyurethane. This produces a material that is designed to insulate and protect. Neoprene is not 100% waterproof as some believe. The fabric is water resistant to a high degree and can hold off water coming all the way through for some time. It is used more so for outdoor water sports because of its excellent ability to insulate against the cold water. 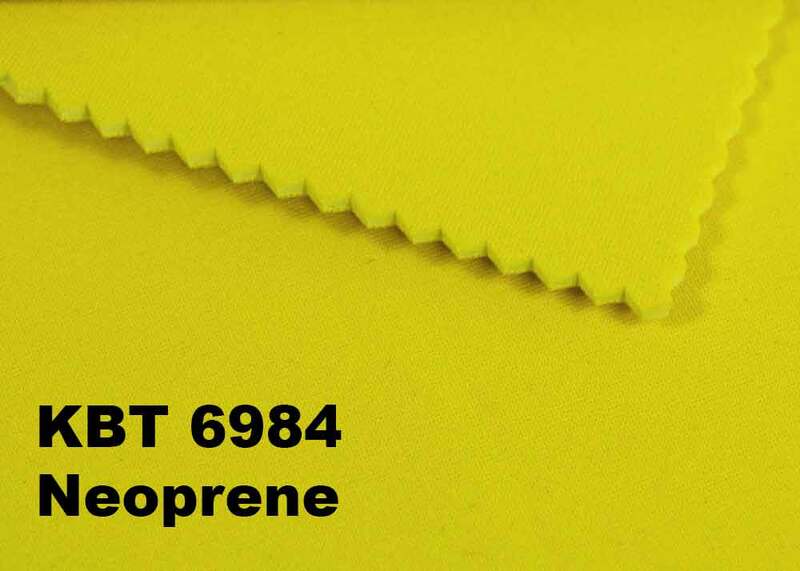 Our Neoprene is available in 20 different colours including fluorescent shades and priced at £12.99 per metre. 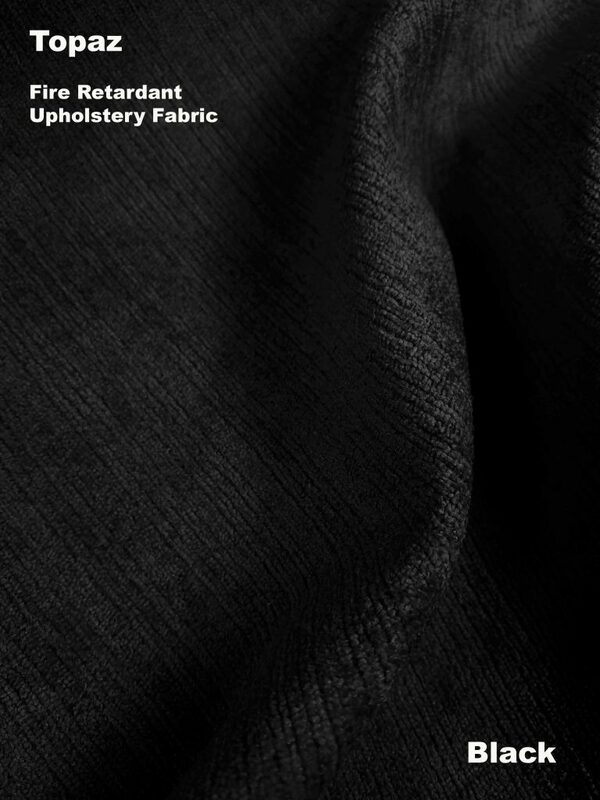 For more info we have a Neoprene blog to scroll through…or click the pic to Fabric UK. Cant decide between glitter or gloss? You don’t have to! 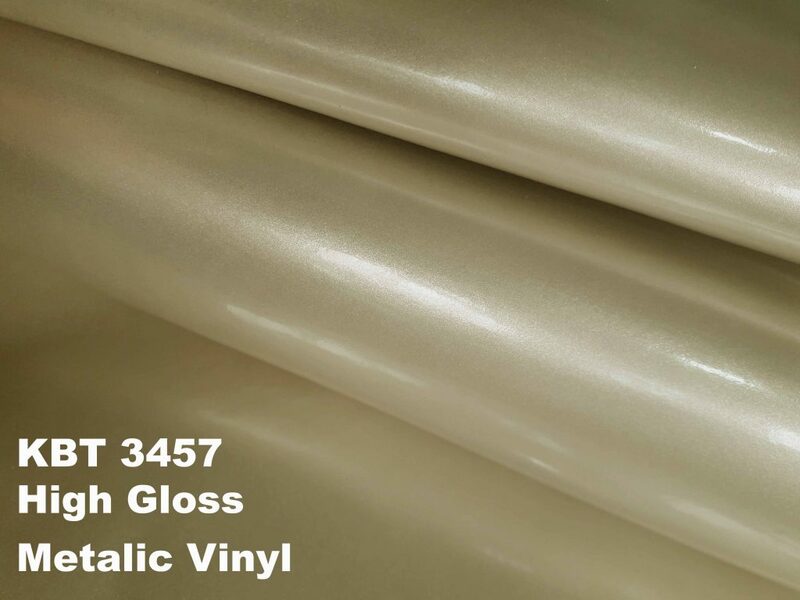 We have a vinyl in store which is packed with fine glitter yet boasts a super smooth glossy surface. How? The vinyl leatherette is made with either a block colour glitter or a blend of two shades to give a two tone effect. Its then coated in a perfectly clear thick PU coating which creates a mirror like gloss finish. Utterly smooth to the touch. 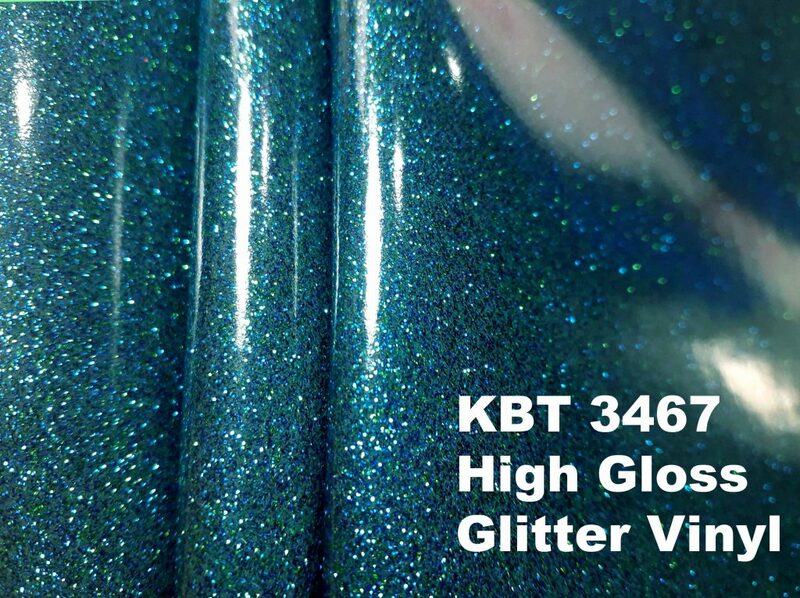 The colour in the picture below is Teal which uses green and blue glitter on a teal leatherette to create the finished look. 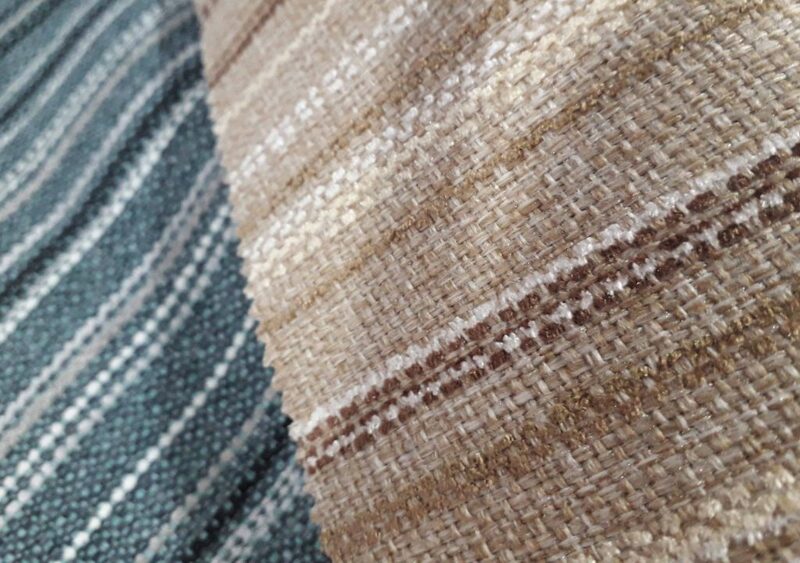 Priced at £22.99 per metre and 140 cm wide, we have 11 colours for you to look at. Just click on the image to see the rest of the collection…. The secret weapon of dressmakers, theatre costume designers and Film and TV set creators. 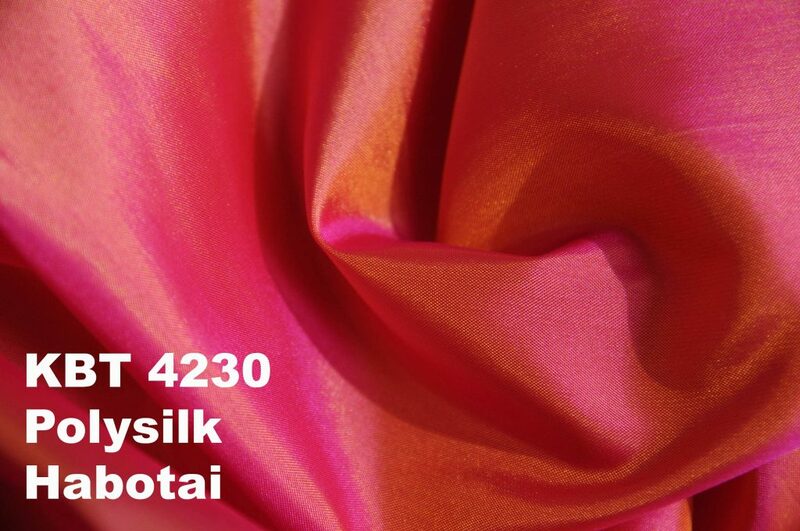 Polysilk Habotai looks truly stunning and always gives an impression of opulence and decadence. The twist is, its just £3.99 a metre! The beautiful two tone qualities are produced using a shot method. Two different coloured yarns are used in the weave. This magically creates a multitude of shade variances which shine out of the fabric depending on light and movement. When choosing a shade make sure you get samples first. The multi shade qualities mean it can differ between our lighting and photography and your computer screens and reality. Either way, this lightweight polyester is sure to wow you. Click on the image below to see the other colours…. 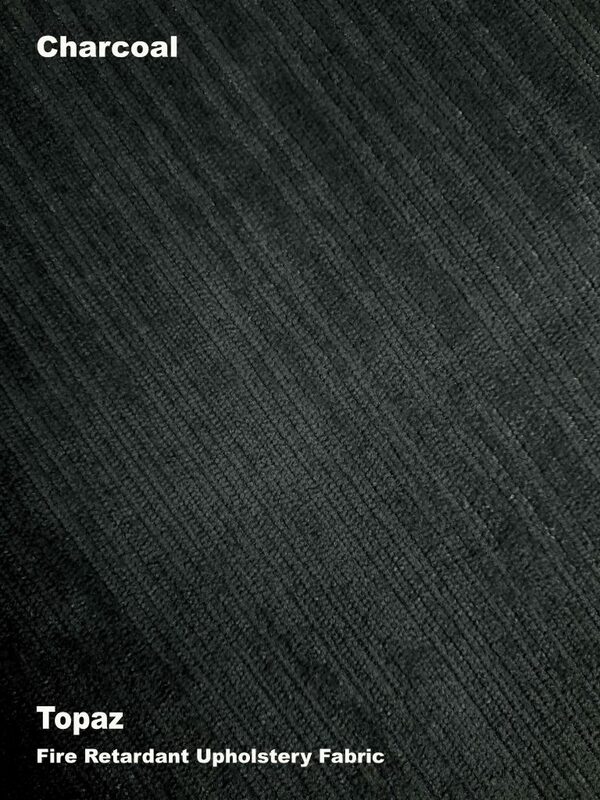 The Techno Look Collection consists of 10 different styles and patterns all in variations of metallic silver and black. 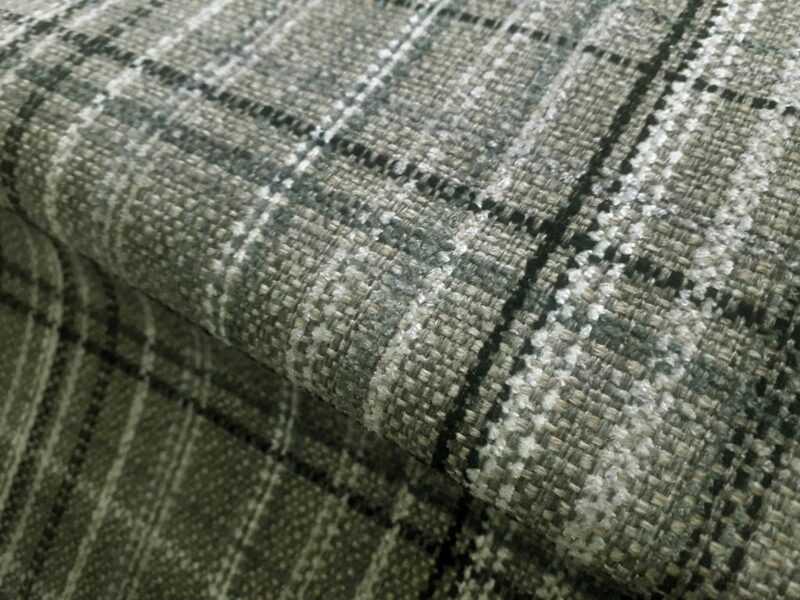 All the variations are priced at £22.99 a metre and 140 cm in width. From metallic Prince of Wales check to mesh look, each pattern is embossed onto thick leatherette vinyl. The sample used in the mystery card is our Metal Ripple style of Techno Look. The pattern is deeply embossed to create a very tactile and visually pleasing leatherette, finished in a soft and subtle pewter silver. 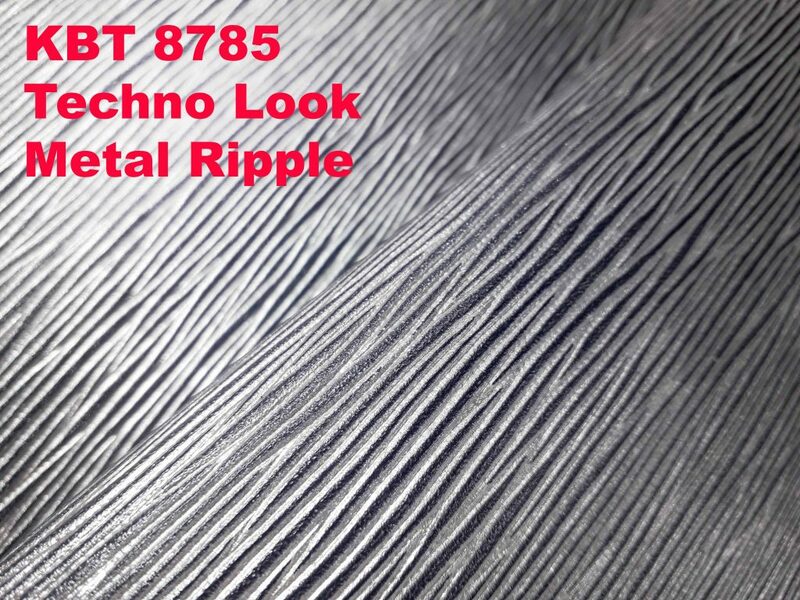 A click on the picture below will take you to the Metal Ripple page, but if you want to scroll through the others in the Techno Look range click here…. Full on fabulous glitter! 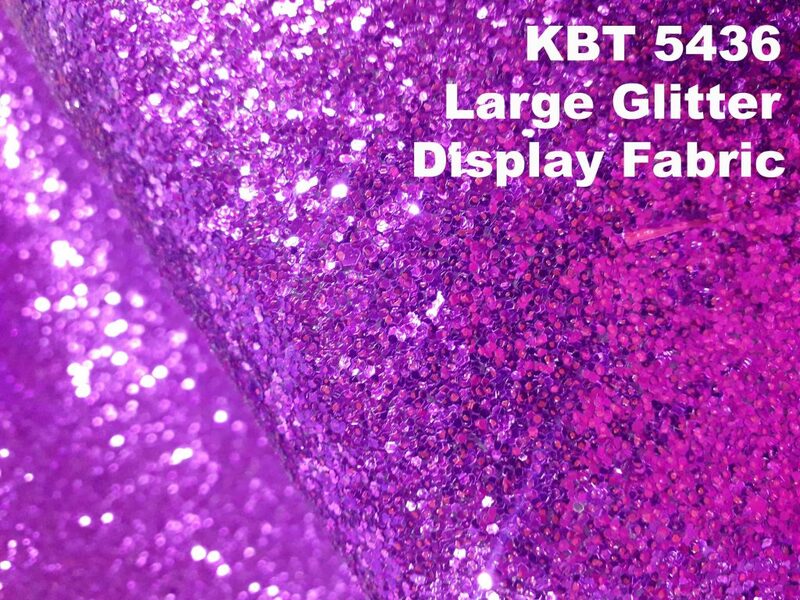 This large glitter fabric is the go to fabric if you want to get noticed. Used in visual merchandising and display, interior design for the home and for all sorts of shops and stores from ice cream parlours to beauticians. We keep a range of 14 exiting colours in store but it doesn’t stop there. We can create bespoke shades, holographic and iridescent mixes too. So if you need to match company colours or to fit a colour scheme just let us know. For bespoke orders a leadway way of about three weeks is needed from colour matching to delivery so if you have plans, get on the phone to us! 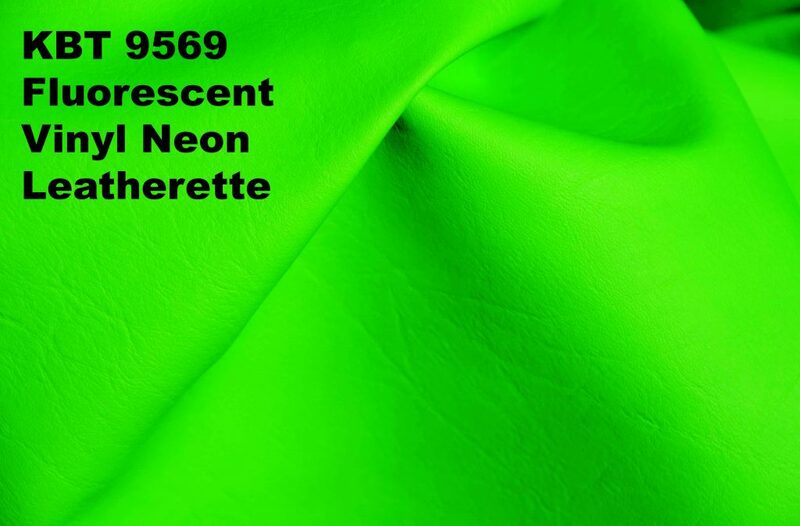 We had been getting a lot of call for neon leatherette from some of our regular clients, so we put out a search for the best and brightest. Safe to say everyone was very pleased with the choice and the range is proving very popular indeed. This has been used in clubs and bars, safety features, festivals, golfing accessories, and sports displays. We have 4 ultra bright fluorescent colours to create a stunning designs to stop people in their tracks. 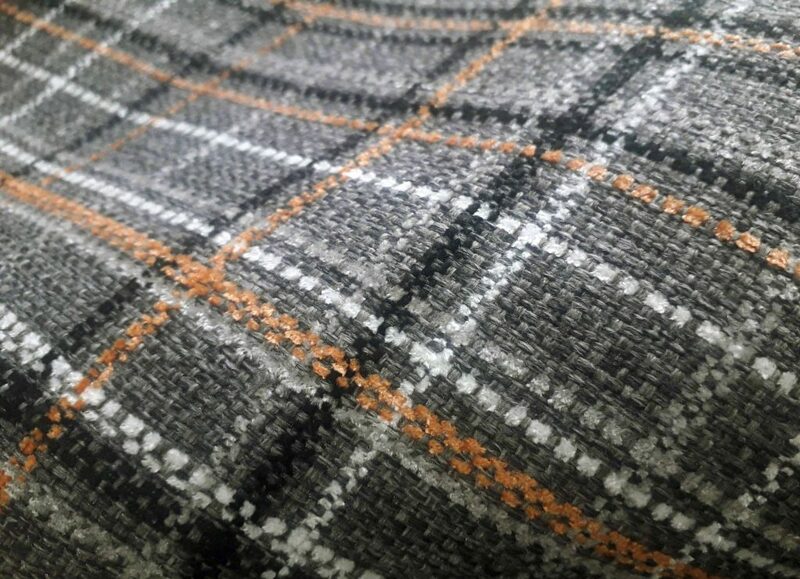 Choose from pink, yellow, orange and green, priced at £24.99 a metre and 150 cm wide. 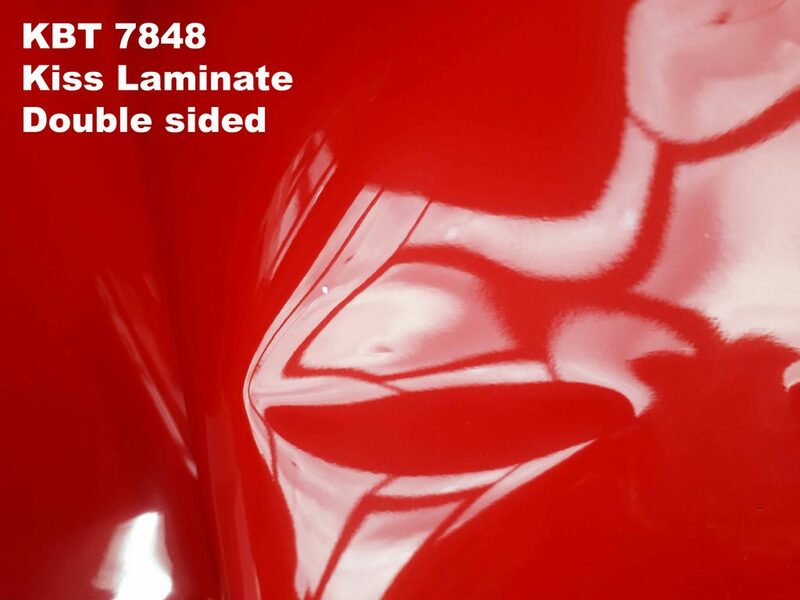 Our High Gloss Vinyl range consists of 11 bold shades, all with a mirror like shine. However 3 of these shades differ slightly. The chocolate , silver and stone shades all have a soft metallic look, which is still covered with the shiny gloss finish, as you can see in the image below. The stone shade is a smooth pale beige colour, perfect for neutral inspired designs. Another relatively new collection, Kiss laminate appeared on our shelves about a year ago 15 stunning block colours,and 7 accompanying shades of white , cream and grey, soft silver and gold and jet black. For those who don’t know how this material works, there’s a surprise inside. You have to unpeel to reveal. Kiss Laminate es ultra glossy, but its hidden inside the double layers. When you receive a sample or a length of Kiss Laminate you have to first find a corner and carefully pull apart each side. This reveals a vivid block colour so glossy you can actually see yourself in. The material is thin enough to get creative with and strong enough to withstand use in displays indoor and out. 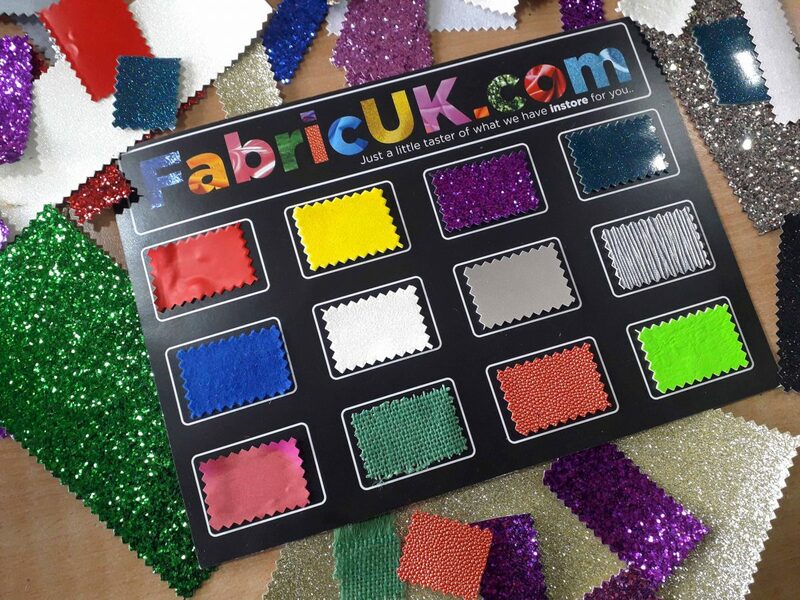 Of course the PVC used to make this glossy fabric is entirely waterproof, so you can create designs for festivals and events that can be left in the rain. If this Kiss laminate has sparked any creative ideas, get In touch and tell us about it! We’ll send you out some FREE samples to get to grips with. 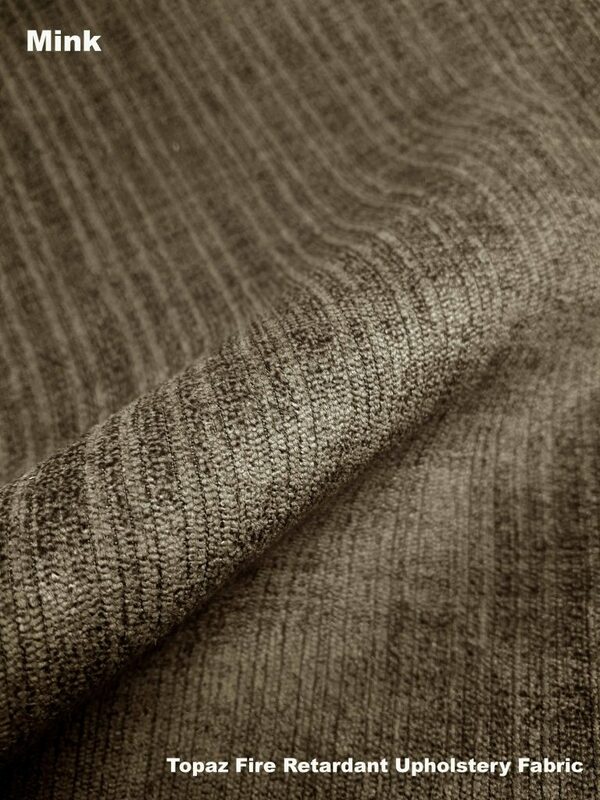 No only one of our oldest fabrics in store, but one of the oldest fabrics known to mankind. This may sound rather dramatic but it’s true. 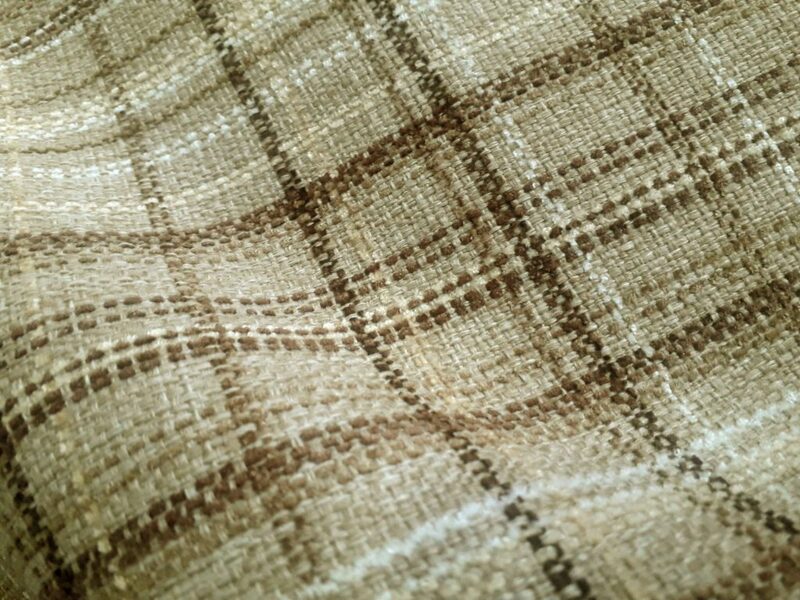 Hessian, sometimes known as Jute (or burlap if you are American) is truly an ancient fabric. Made from very strong fibres of the Jute plant it was first created to aid day to day farming. It’s strength made it invaluable for storing and moving crops. Then quickly became integrated into everyday life. Hessian is still used for farming and food producing around the world. 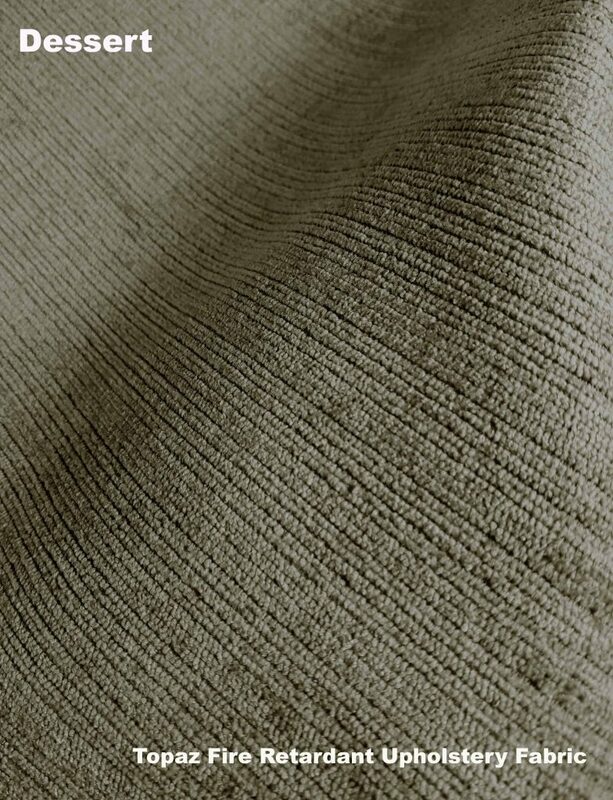 However, this humble fabric is also recognised for its aesthetic rustic qualities and is now sold in huge quantities for festivals, weddings, events, interior design and crafting. We stock several kinds of Hessian for all sorts of uses. Traditional untreated, wide width, pelmet, stiffened, self adhesive, laminated and fire retardant. 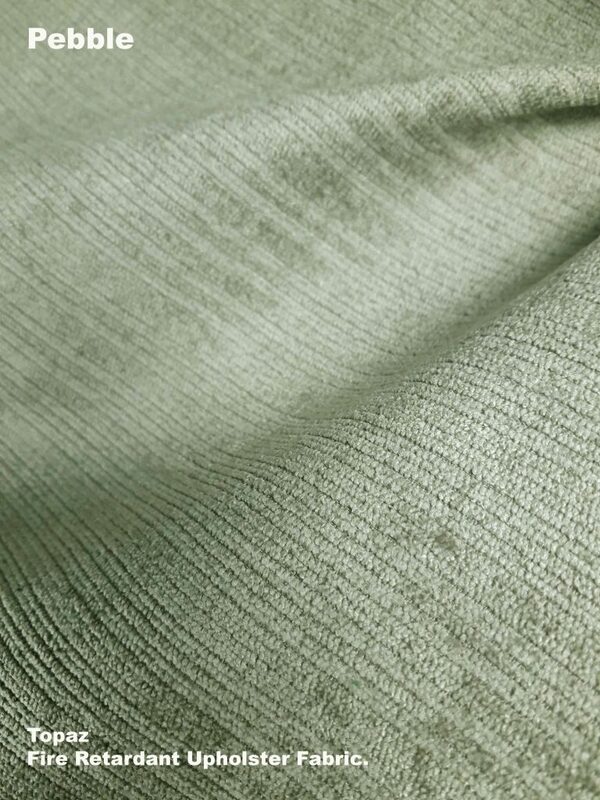 This grass green offering is from our Hessian Fabric Coloured Jute Cloth collection priced at £4.99 a metre at 150 cm wide. 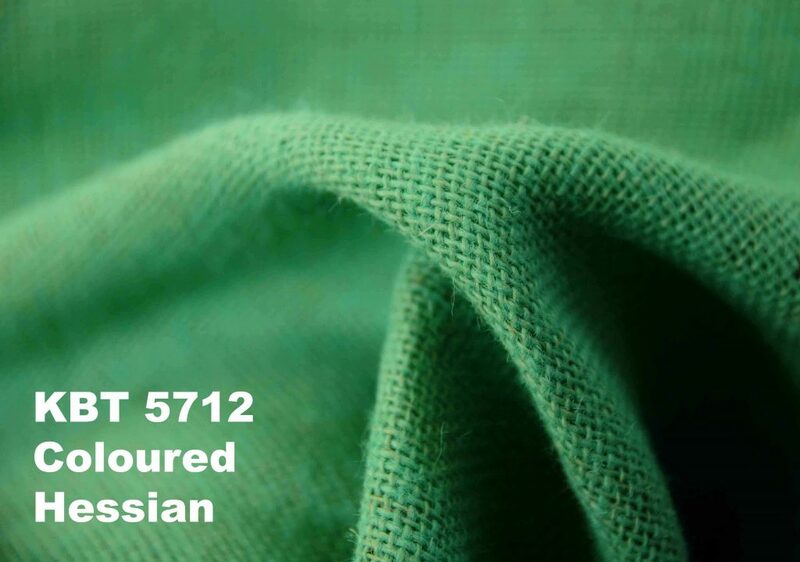 Click on to look at more colours or click here for the full Hessian list. microstructures that interfere with light. The effect is created on a miniscule level, and this is the same for glitter. Some is created to recognise the pale areas of the spectrum, these use pale shades or a transparent base to start with like insect wings or shells. Others are created in dark green and purple deep iridescent tones like peacock feathers and beetles. 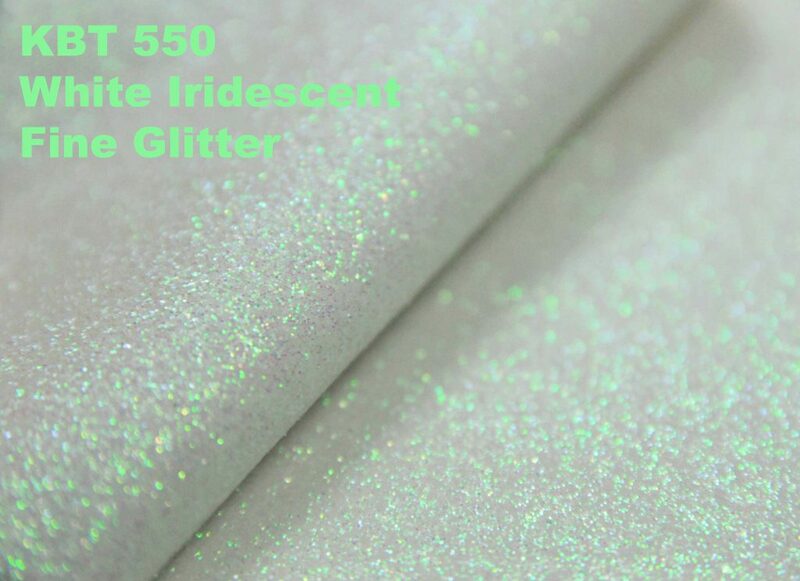 This iridescent fine glitter display fabric catches shades of pale violet, coral, pink and mint green. The overall look is ethereal. The colours move and dance around the fabric as the light moves. A really sparkly spectacle. So now the answers to the Mystery card have been unlocked! 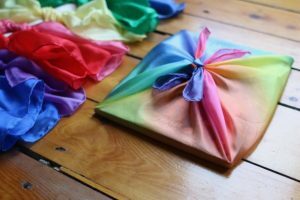 I hope some of these awesome fabrics have sparked ideas for your upcoming projects. Thanks to everyone who found the time to talk to me at the Visual Merchandising and Design Show. 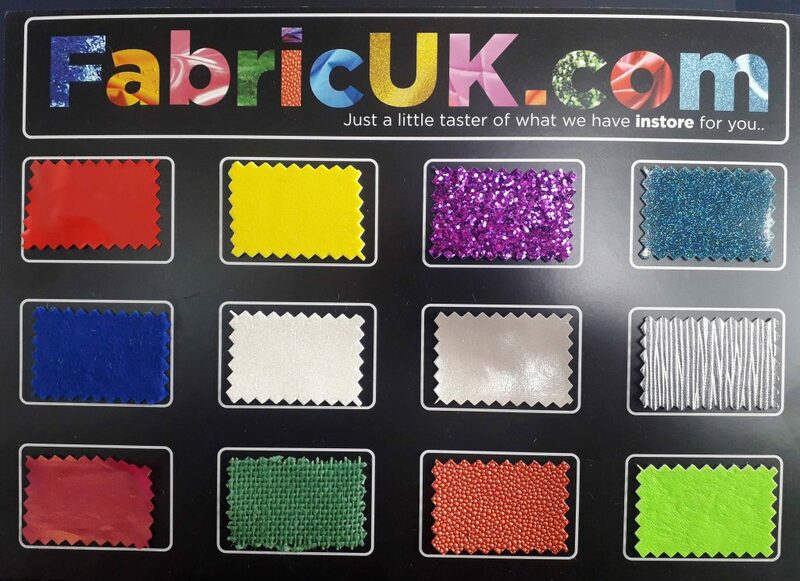 If there is any information you need, or advice on your next creation, Give Fabric UK a ring and ask for Kat or message me on Fabric UK Facebook. We are open to the public if you ever want to have a wander in. If not, grab a coffee and cave a wander through or Fabric UK website. If you don’t have time to scroll but you need fabric, just give us a call. 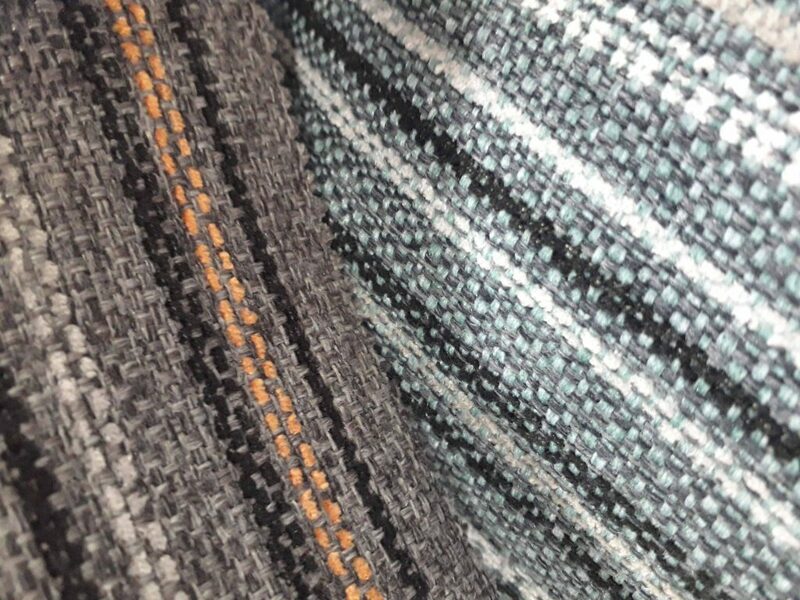 If you know exactly what you want or if you only have a vague idea, we can talk through your project and find the right fabric for you. We will send you samples just to be 100% sure it’s what you need. After you have decided, you can call us to make an order over the phone, online on the website, paypal or we can send you a pro former and you can pay via BACS. 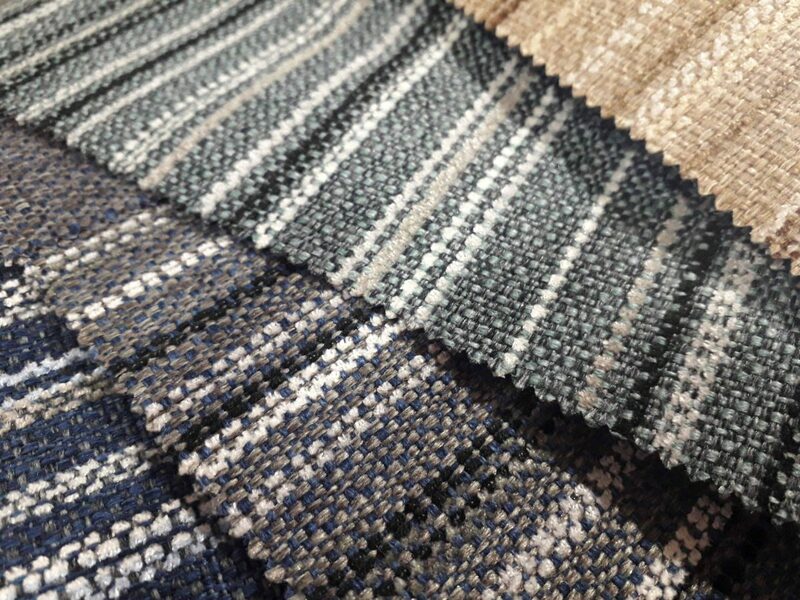 Part of the Lomond upholstery range, the Lomond stripe collection consists of seven shades of quality upholstery fabric. 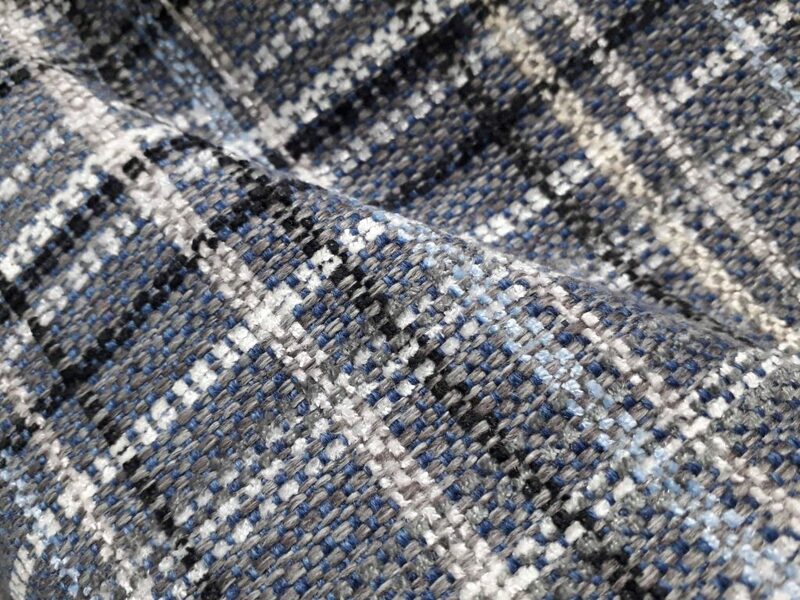 The colours are designed to mix and match with the plain and check Lomond version of the fabric. Subtle and subdued shades of grey, blue, teal and beige, ready to add to a colour scheme or blend with on trend neutral interiors. 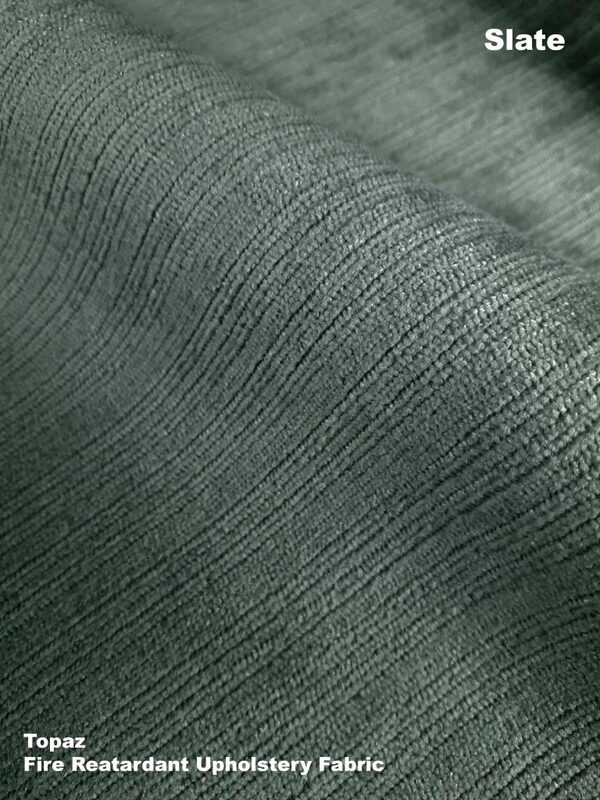 Made from shiny polyester, this lurex fabric has a larger structure than average lurex . 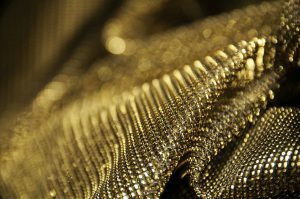 This larger weave creates a chainmail effect, great for costumes and cosplay. 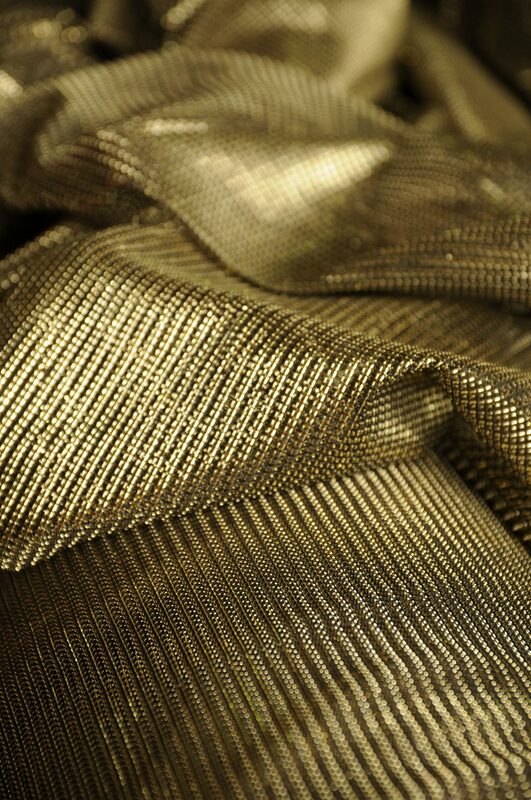 Both the silver and gold use black as an extra element in the weave and this produces a gorgeous two tone effect in the fabric which changes with the light and movement. The silver has more of a pewter look due to the two tone black and the gold is a deep rich tone. The fabric itself is a sheer, semi translucent lurex. For example, when you hold in front of an item you would be able to partly see through to it. This is fine if you want to use the fabric for display or flat against a wall, but not if you want to hide anything. 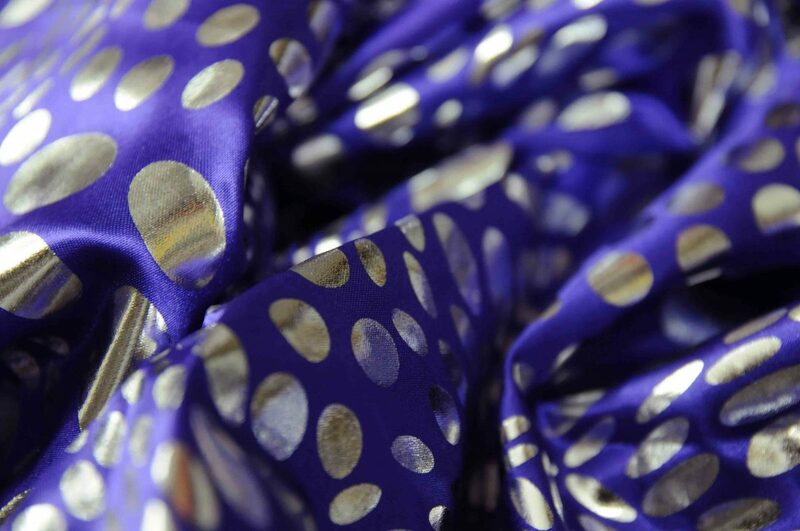 For dressmaking and costumes there are so many uses for this sparkle fabric. 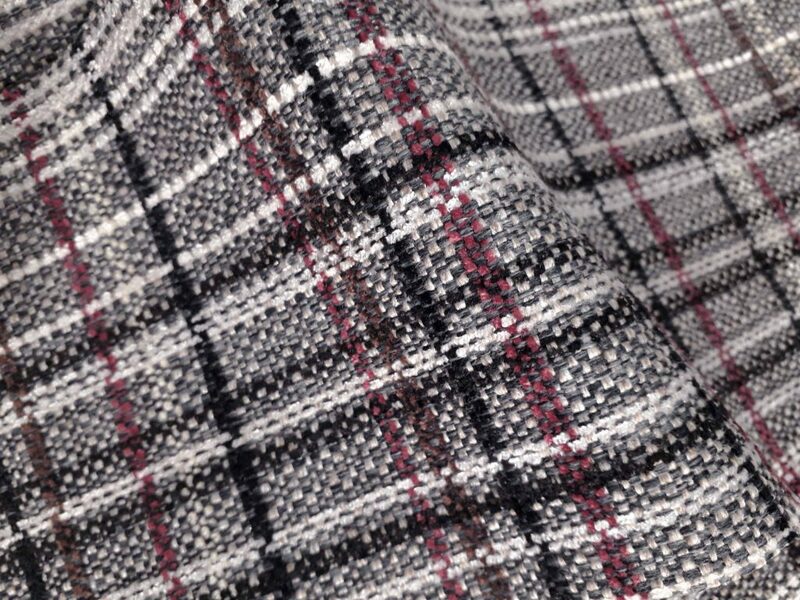 Named after Loch Lomond area in Scotland, The Lomond check collection is inspired by the traditional tartan patterns Scotland has made iconic. 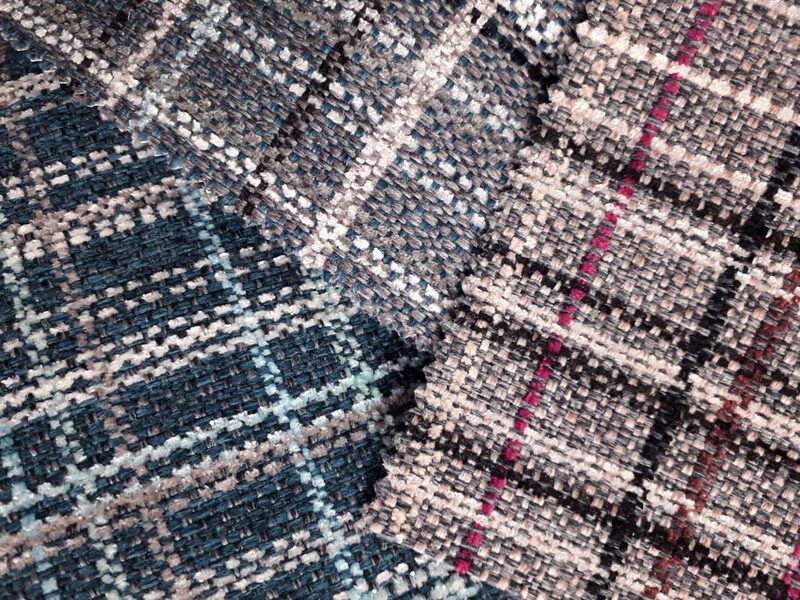 The Lomond patterns are all woven (not printed). So each colour you see has been woven from a separate length of yarn to create the finished effect. 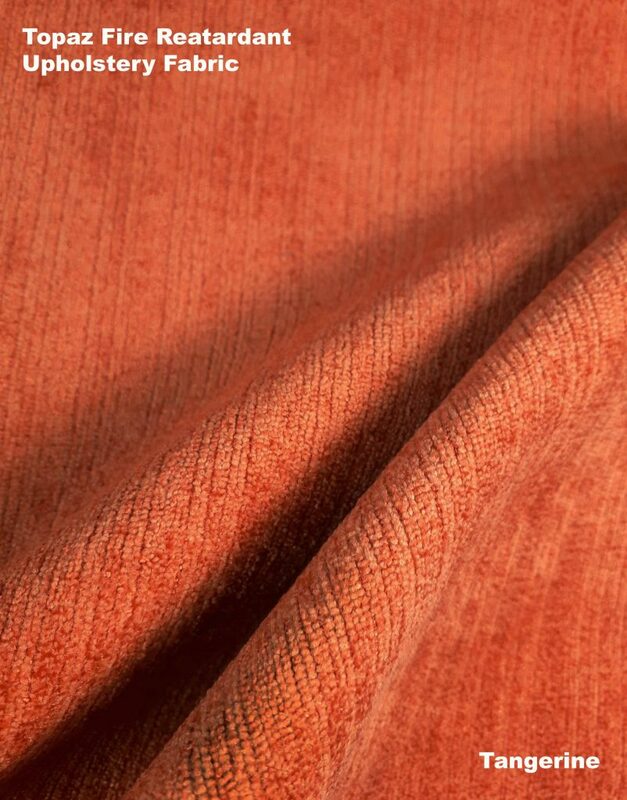 Made to be fire retardant, you can use this traditional look fabric on upholstery and decor for pubs and cafes, and knowing its regulated to British safety standards. Made from a blend of 100% polyester to produce high quality fibres, these are bunched together to create a thick length of yarn which is used in two ways. Some is used as it is and some is cut to create a tufted texture. The bottom, or background layer is produced using the bunched thick yarn. If you look very closely you can see the separate fibres. Some of the yarn uses a blend of shades in one length to give it a mottled look. 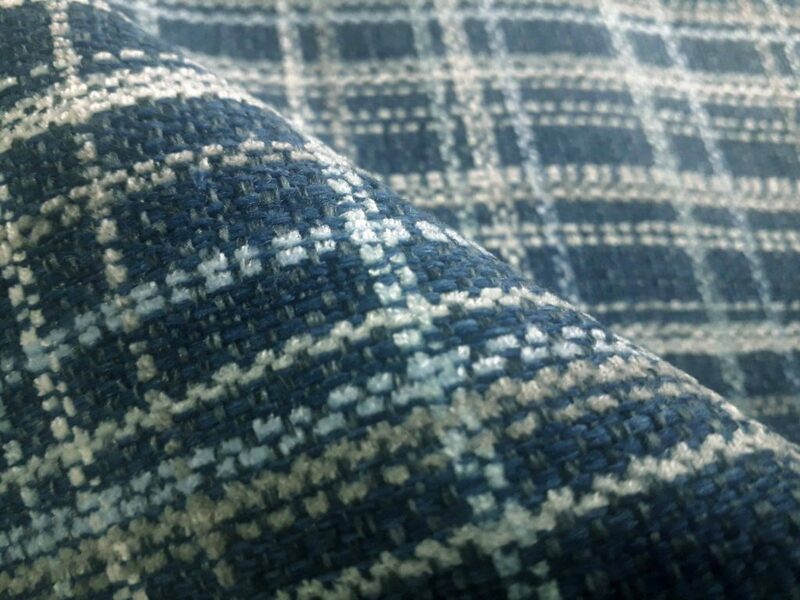 The top layer of criss crossed lines uses the tufted yarn for the high and low light colours. 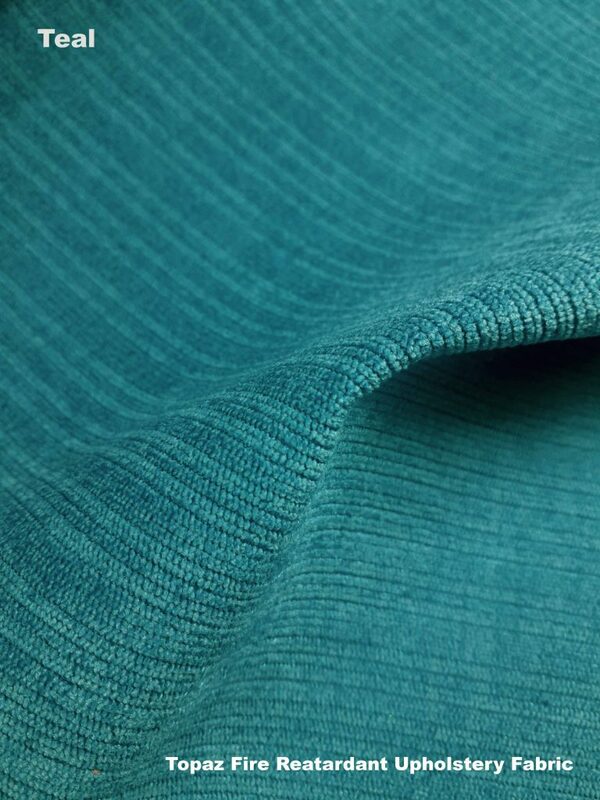 This use of two types of yarn produces a great quality fabric which feels both smooth and soft. Seven colour mixes to choose from, in subtle tones of grey, soft mid blues, teal and golden wheat. Scroll down to take a look…. Samples are available, so you can take a closer look before deciding. Just call us on 0121 359 2349 or order a sample from our website. 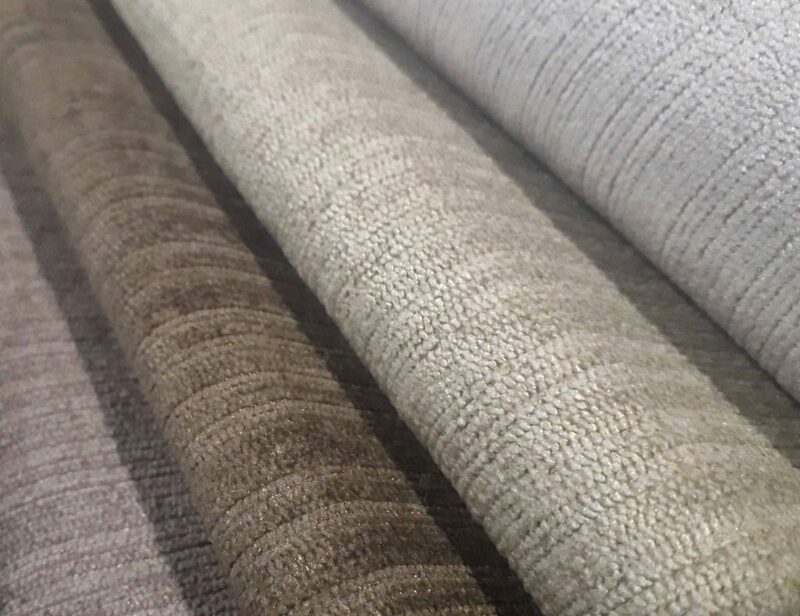 Part of our extensive soft feel upholstery range, Topaz is a great all rounder if you are looking for a smart sleek finish, with safety and durability. Topaz is designed to be fire retardant and upholds to the British fire safety standards. You can even print off your own copy of the test certificate. If you are planning in interior for a public place such as a hotel or restaurant, fire retardant is not only expected, but in many instances it is the law. 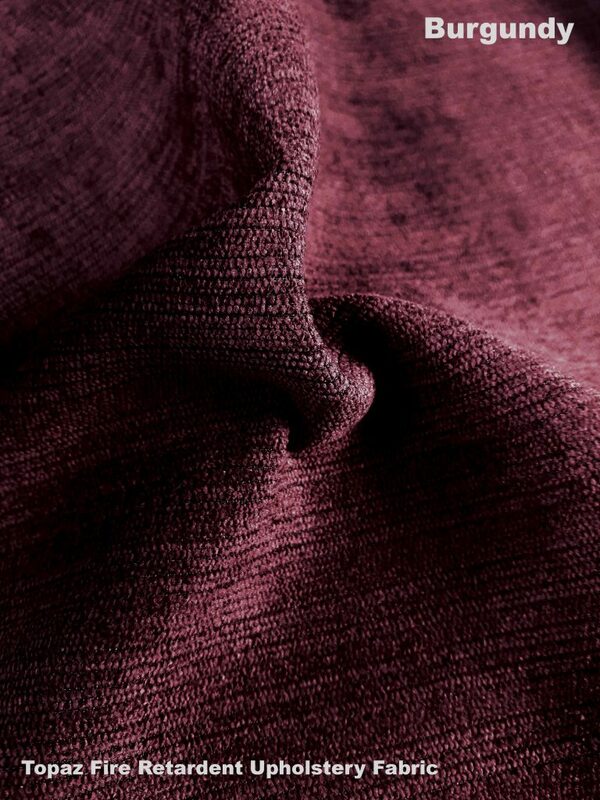 Topaz uses a close clipped velour to create a fabric that balances in between Chenille and velvet. 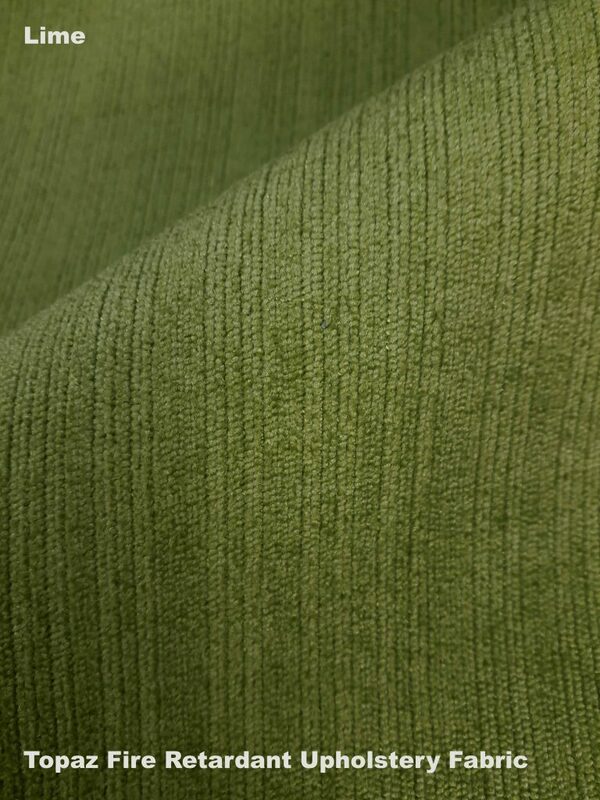 The feel of Topaz upholstery fabric is soft, with the very short pile giving a sleek finish. The textured detail shows neat lines as fine as pinstripe. These make up the thicker bars of 1cm across that run continuously throughout the fabric. The very darkest tones. Grey, Charcoal and classic black. These tones are ready to work wherever you choose to put them. The classic black will, of course go with anything, but splashes of brights like lime or tangerine will look awesome. Tangy tangerine and lime look fab together, if you like your colours contrasting. And that goes for Pink and teal too. Alternatively you could keep the colours with their closer colourwheel partners. Personally, I’m a big fan of orange and pink at the moment. This trio of delicious colours are a homage to two of the finer tastes in life, chocolate and wine. Bournville is named after the dark chocolate produced in the village of Bournville in Birmingham. Burgundy is a historical region in France, famed for its wine production. Though the shades of wine and burgundy look similar, please note, wine has a slightly warmer tone. Two pale tones and two mid tones. These could all blend equally well with each other to create a neutral themed interior of warm oatmeal, stone and beige shades. You could also pick any one of these to add to the rich palate above as a lighter accent. Grey shades all hold a the faintest hint of a color and this can determine what shade they are best to mix with. Slate grey is a lighter option than the deep inky tones of charcoal and grey and has a slight hint of blue to the mix, tipping it firmly into the cooler area of the colour wheel. The pewter colour of slate invites colour combos of pale to dark blues, purple and plum, aqua, teal and cool greens. In comparison, the shade of Grey in Topaz upholstery range shade is slightly warmer in tone and would work better with lime green. 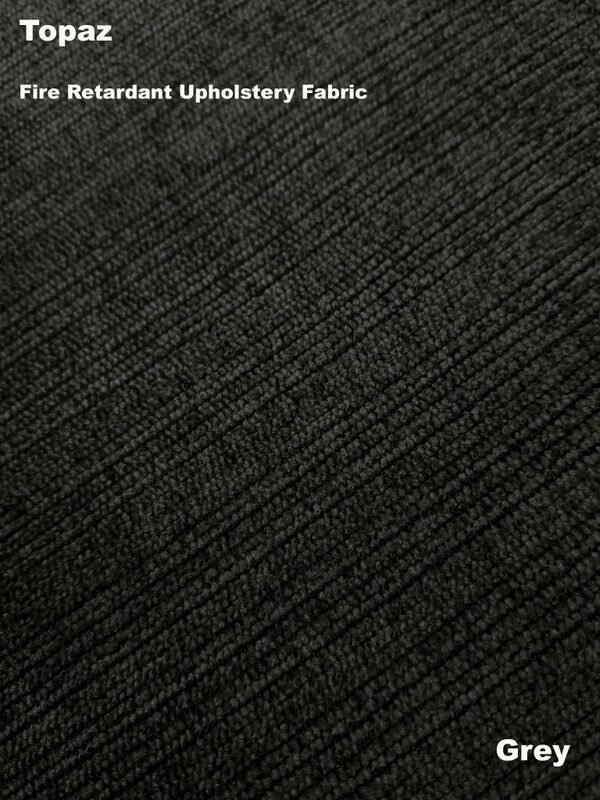 Slate, a handy mid tone Grey. 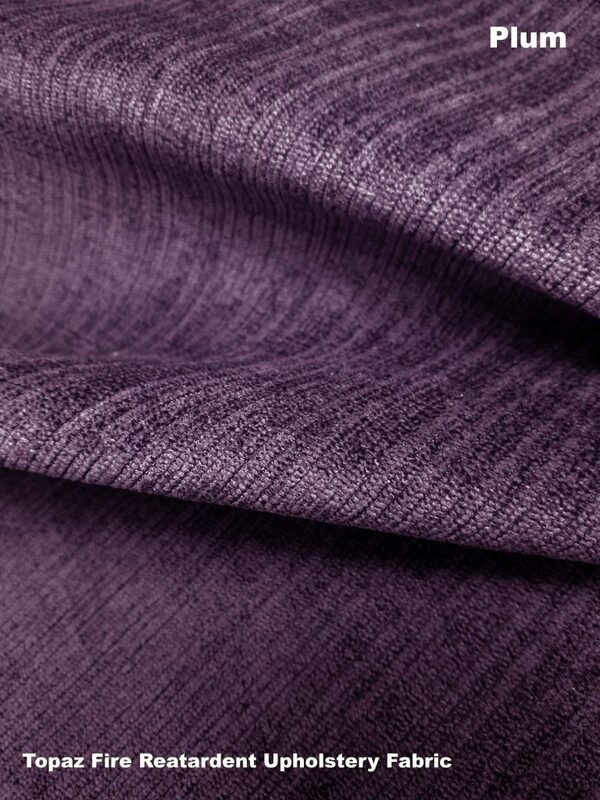 Plum, looks good with slate grey. If you like the look of this upholstery range, why not call us for a free sample so you can get a feel as well! 0121 359 2349. 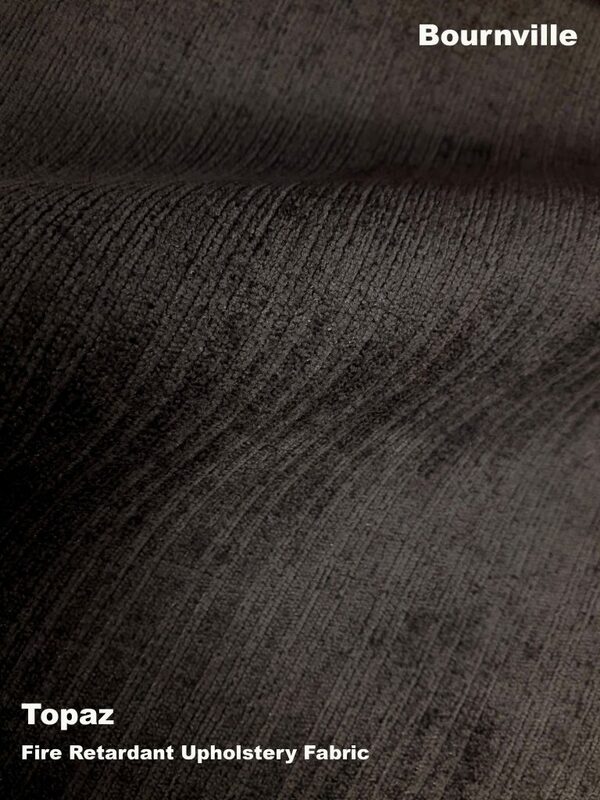 Our new velvet certainly lives up to its name, it really does feel luxurious. 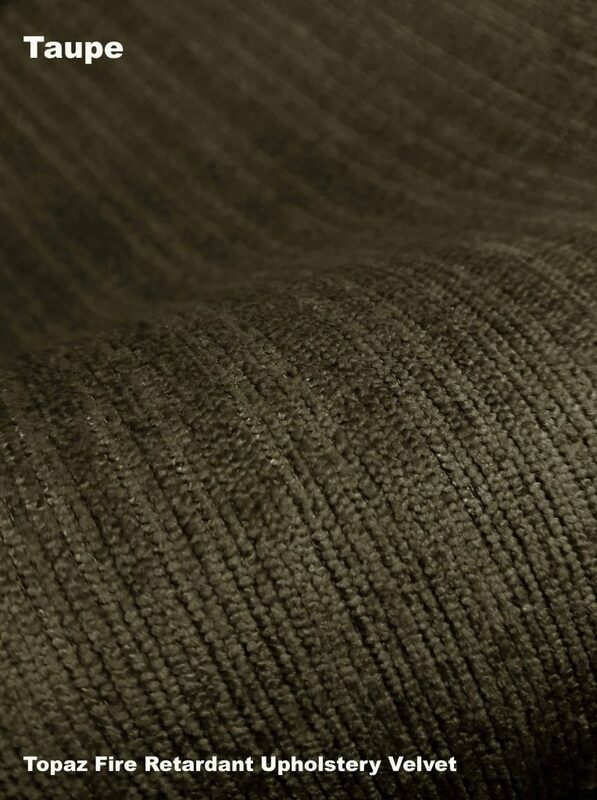 The close clipped pile is created from a high grade polyester weave. 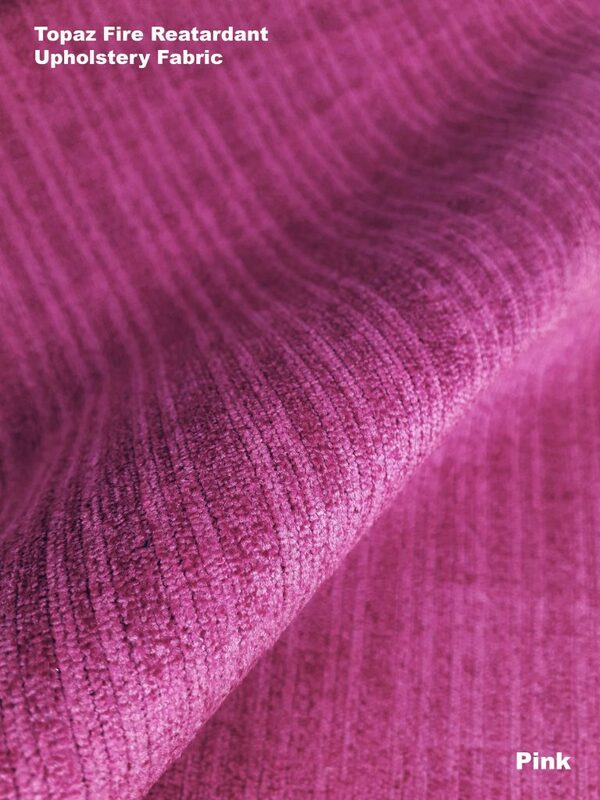 The ultra-fine fibres create such a soft pile with a perfectly smooth finish; it’s hard to stop feeling it! 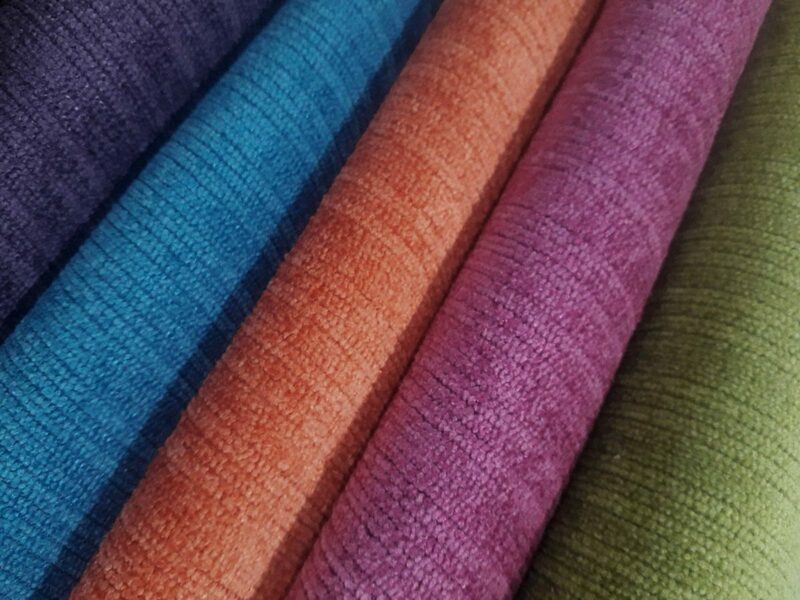 Priced at £12.99 a metre and fully fire retardant, this is the perfect fabric if you want to create a super smooth interior for luxury lounging. 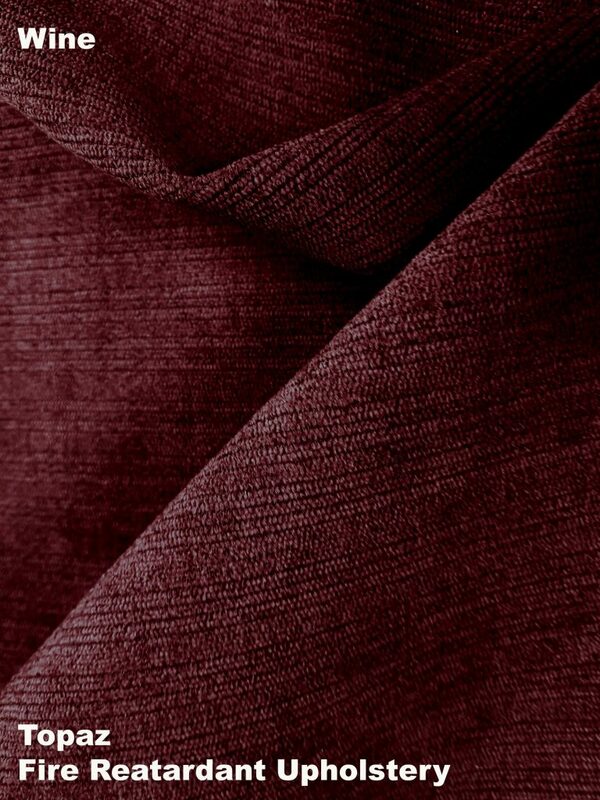 If you want to know more about this beautiful velvet, click on…. 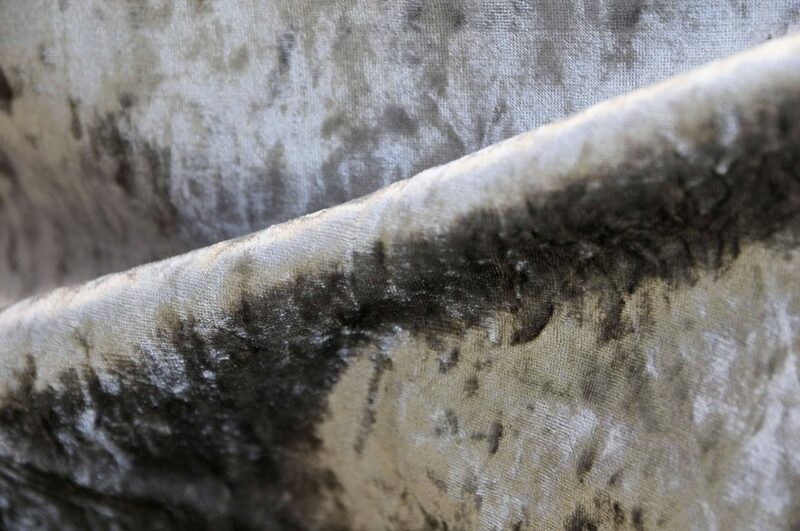 Ultra-luxurious crushed velvet, designed for upholstery and soft furnishings. 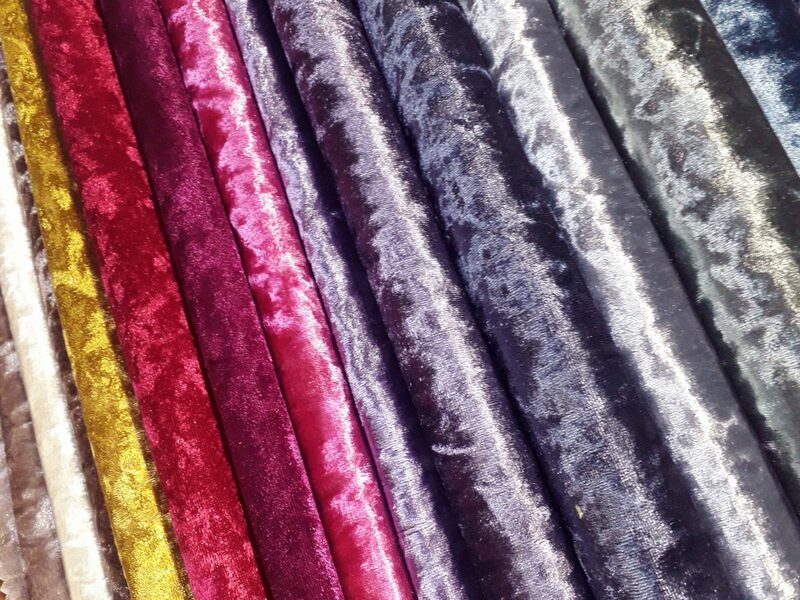 Bling velvet uses 100% polyester to create a fantastic fabric, seen in the best interior designs and upholstery upgrades. The surface is textured from the attractive crushed effect, giving it a high lustre which refracts light at every angle it displays. 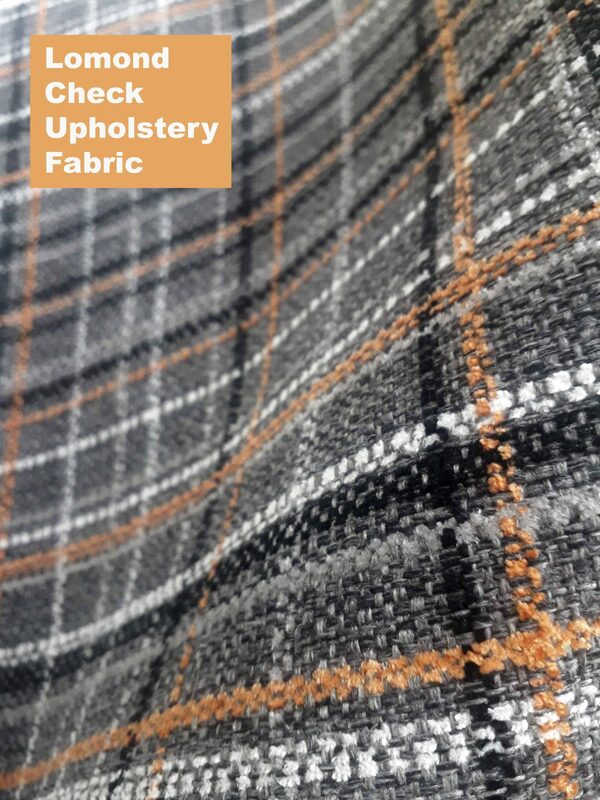 A mid weight and taut structure makes it perfect for soft furnishings and upholstery use, and can easily be used on standard household sewing machines. Popular interior design uses include headboards, padded panels, sofas, armchairs, footstools, cushions and curtains. Read on to find out more about our collection…. OK I’m sure we can all agree the rows and rows of shining wrapping paper that greet us invitingly in shops each Christmas looks beautiful. Choosing from the multitude of designs can take longer than choosing a present! Glitter adorned, metallic or matt. Classic or contemporary. Wrapping is serious business. The money made from these pretty pieces of paper alone is huge. Let alone the abundance of gifts swept from the shelves into our baskets. As great as it looks, buying new wrapping paper every year just to throw it instantly away isn’t very good for our pockets. 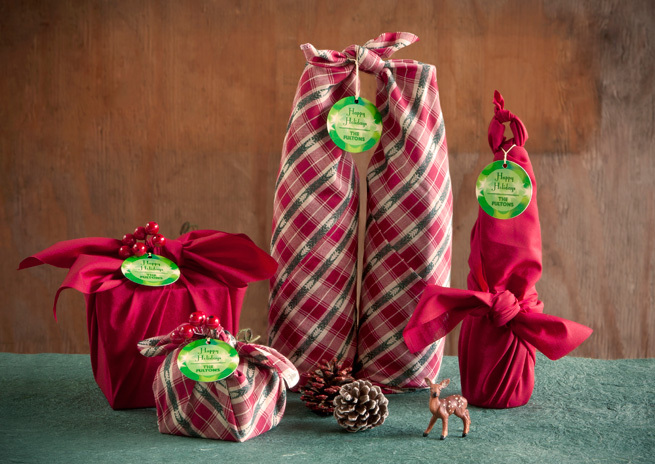 It will surely take an age for people to change their minds about paper wrapping paper. But until then, here’s you chance to get creative and make your gift really stand out. Time to look back into history for a bit of forward thinking…. Pantomime and Props : Showstopping Fabric to Show Off! Sherpa and Fleece are the perfect duo for keeping snug and warm this winter. Thick Sherpa fleece make an ideal lining for jackets and coats. Fleece feels soft to the touch. These two are used so often together for top layer and lining it made sense to merge them as one fabric, so we did! 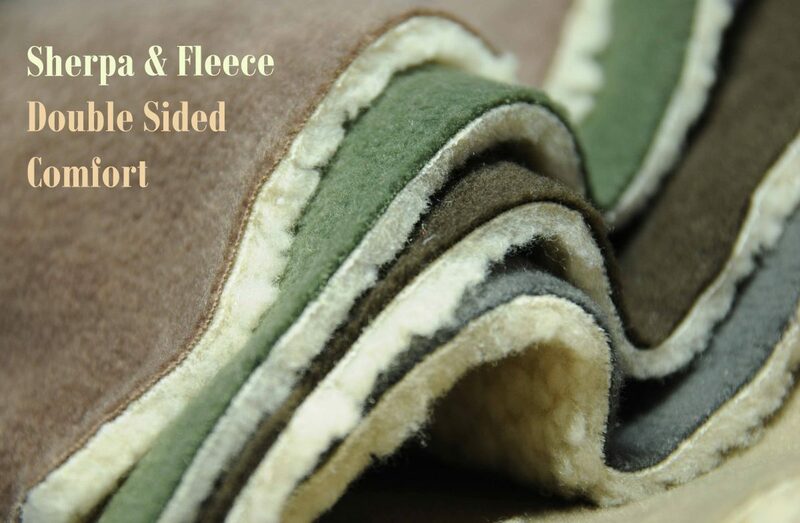 Fabric UK present to you, Double Sided Bonded Sherpa Fleece….